How To Get New Twitter Profile Design And What To Expect From It? 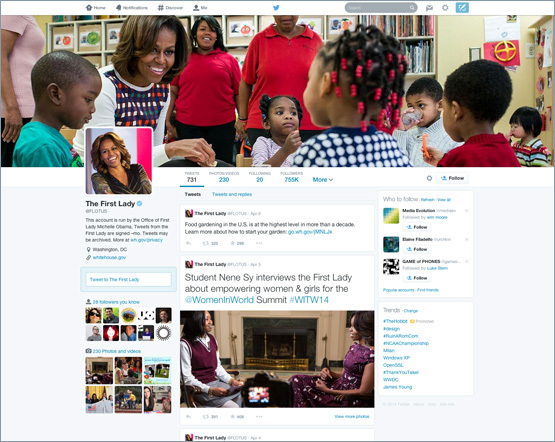 Twitter, the very popular online social network and microblogging service has recently released a new profile design. The new Twitter profile is being rolled out to the users and Twitter has made it clear that the new profile design will be turned on for all user accounts by May 28, 2014. If you are a big fan of Twitter and can’t wait till May 28 to check out the new design, find below how you can get the Twitter profile design in an instant. How To Get The New Twitter Profile Design? 1. Go To https://about.twitter.com/products/new-profiles . 2. Scroll down and you will find the blue ‘Get it now’ button. 3. Hit on the ‘Get it now’ button. Log in if you haven’t already done so and you will get the new Twitter profile design. What Are The New Twitter Profile Design Features? The new Twitter profile is a complete redesign from the old look. The profile design now looks strikingly similar to that of Facebook. The new profile design has also added a lot of new features to Twitter which makes it a great joy to use. So, lets see what the new features are. 1. Best Tweets: Tweets that have garnered more engagement (replies, re-tweets and favorites) appear slightly larger. This makes it easy for you, as well as the visitors of your profile to know which tweets have performed well. 2. Pinned Tweet: The new Twitter profile lets you pin one of your tweets to the top of your page. You can pin your favorite tweet or a tweet that defines you to show off your personality. 3. Filtered Tweets: When you visit someone’s profile you can now choose to see their Tweets or Tweets with photos/videos or Tweets and replies. Along with the above mentioned features, the new Twitter profile also boasts of a larger profile picture and a customizable header. You can use your own header image or choose one from the header image gallery provided by Twitter. Though the new Twitter profile design might be scorned by some for looking similar to Facebook, it improves the look and feel of the profiles and also adds a lot of useful features to Twitter which should improve the overall engagement of the platform. Get the new Twitter profile if you haven’t already got it and pour your thoughts about it below. Next post: How To Shop On Amazon From Within Twitter? Previous post: How To Enable And Use ‘Nearby Friends’ Feature On Facebook?